Roger doesn't like this really good movie too much. He gave it a thumbs down and only two stars. 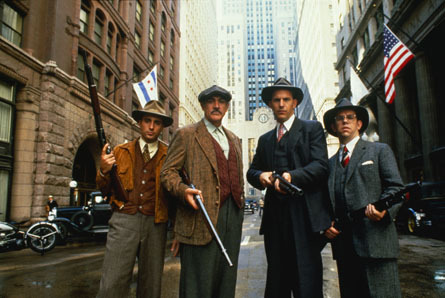 He said in his review "The Untouchables has great costumes, great sets, great cars, great guns, great locations and a few shots that absolutely capture the Prohibition Era. But it does not have a great script, great performances or great direction." I disagree with it not having a great script, performances or direction.. I loved the writing, De Palma's direction and the performances. I really enjoyed Sean Connery's performance as Jim Malone and I thought Robert De Niro was really good as Al Capone too. I did have some issues with some of the distortion of the events, but overall I found it to be an excellent historical movie. The homage to the Battleship Potemkin steps scene alone makes it worth viewing. The movie has an 8.0 rating on IMDB but Roger's two star review is telling people not to see it. That was a big mistake on Roger's part. This review is 100 percent true, not sure why it was on this worst review list. In summation, this post states "I disagree with him, because I loved it. He is wrong, because I disagree." Roger elaborated on all of his dissatisfactions with the film. Please explain what you believe makes the writing and the performances and the direction so strong, so there may be an actual deconstruction of his argument, rather than an unfounded refutation of it. 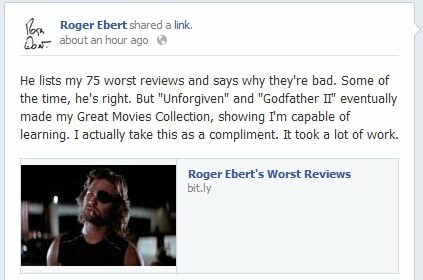 I respect Roger Ebert, his reviews really mean something to me, usually I read them on imbd, after watching a movie and in most cases I agree with him, more or less that is. But to give "The Untouchables" such a bad rating/review is weird, or at least it seems to me that way after watching this amazing movie last night. I gave it 9/10. A Clockwork Orange for example is great but isn't for everybody, the Godfather part II is amazing of course but i still prefer part I (the best movie ever made imo), but "Roger Ebert's worst review" isn't on this list for me, its his review for Prometheus, which he gave 4 stars. From Ridley Scott I like most Alien, then Blade Runner, Kingdom of Heaven, Gladiator is highly overrated but still okay, but the new Prometheus was just unexplained and terrible, but hey that's what I think and movies are subjective after all. Anyway a nice list sir, you do have a point here. The Untouchables was horrible. Stupid dialogue like, 'Let's do some good!' along with the nerdy character that kept mentioning how Capone could be brought down by tax evasion, but kept getting ignored throughout the film (hee hee, so clever) are just a couple of examples tlof what is wrong with this movie. The shootouts were ruined by melodramatic moments. Again, the nerdy character shouting 'Stone!' like a two year old baby, and then charging with his gun, shouting like a spazz. I shouldn't even have to mention the infamous baby stroller, stairs scene. Frank Nitti, saying 'Nice house. I said nice house' before Ness could even reply. I could go on and on. The very ending, in all its cheesiness, pretty much sums up how lame this movie is. What are you going to do now that they repealed prohibition? Guess I'll go have a drink. Then Ness walks away like a total stroke as the reporter shakes his head and gives him a 'oh you,' look. Sorry, but I hated this movie. Ebert was too kind. He should have only gave the movie a half star, and that's just because Connery and Deniro were decent in it. He gave it Two and a Half stars, actually. Actually, Ebert himself--God rest his Pauline Kael-esque soul--gave this two-and-a-half stars. He was one of the few... the VERY few detractors. Those who remarked to PARAMOUNT and Brian De Palma's "UNTOUCHABLES" as... "Eh, I didn't like it." When I first saw it, something about it... just didn't feel right. It... wasn't quite great. Why? Well, I couldn't quite put my very finger on it (as a child). But... I think I got it now. Actually, I think Rog articulated it quite well. The film captures the prohibition era right down the very smallest, tiniest detail. This film was made in the 1980's? Hell, I never would have guessed. NEVER. I was fooled. I'd swear I was back in the Windy City at the very beginning of the 20th Century. Only the famous faces of Andy Garcia, Kevin Costner, Sean Connery and remind us all this is contemporary, this is Hollywood. It's an important theme--but Ebert says it better than anyone when he points out that the movie leans way too heavily on the crutch of old dramatic pulp formulas and clichés rather than the hard brass facts. Costner is a bore as an actor and has always been. Never more before than he is here. DeNiro seems important and grand, but not enough about what made his so epic and important. Not enough of the vision of what made Capon a legend in his industry in the first place. He gives a few monologues here and there, the kind David Mamet is so famous for. Hell, even got him a Pulitzer for. He was nominated for another one after "GLENGARRY," you know. There's good reason. And he DOES bring that personal uniquely Mamet touch. But not often enough. Ness is still smiling somewhere... Somewhere... More than anyone. Aren't we all? This movie is a childish take on what could have been a serious movie. The dialogue is on par with Armageddon or a 1930's radio serial in how unnatural it is. The post four above this one nails their explanation of the cheesiness of it. "The Untouchables was horrible. Stupid dialogue like, 'Let's do some good!'"